Description: The daisies are in bloom, must be June as 205 rolls past MP 231 approaching Owego. Description: 205 is about to pass under the US 220 bridge at the west end of Waverly. This shot gives a view of how things changed there in the previous decade. The train is on the original #1 track. The roadbed for track 2 is visible as the overgrown section to the right of the train, then as a tail track for the Leprino Foods siding. Part of their former siding is seen in the bushes to the far right. The red building at far left is approximately the site of the Erie station, which was demolished by a 1967 derailment. The connection to the ex Lehigh Valley is about where the overpass is in the distance. Description: 205 passes the rock cut at Wellsburg, about 7 miles east of Elmira. The shale rock formation on the right is typical of the area. Description: 41T with a pair of GEs in tow, rolls along the frozen Susquehanna near Campville with 87 cars. Description: 41T rolls through the pair of signals at MP 228 in Campville. The eastbound board here is new, replacing an old Erie target about 1/2 mile to the west. The westbound signal here will be replaced when the line is single tracked 10 years hence. 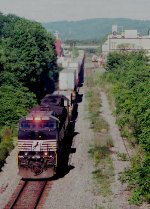 Description: Train 412, a train that will run through onto NS at Enola, is getting underway from East Binghamton behind an ex CR GE with 53 cars. Description: This eastbound sucker snuck up on me! I was walking the line to see the MP 35.5 position light when I heard the grade crossing bell sounding and turned around to see this monster bearing down on me! If I was deaf, I'd be a bloody smear on the Illinois countryside! Description: A photo of NS D9-40CW 9099 and SD70M-2 2654 along with PRR GP9 7048. Description: Eastbound ballast train on track two. Description: With four brand new units this mixed freight works its way downgrade. Description: This seven unit lashup looks impressive heading downgrade. Description: 213 was operating with two units as NS 9099 was dead and drained. Description: RT. 602 is a great shortcut to US 33 and Harrisonburg. This bridge was built in 1918. Title: "We're proud of our Railroad Heritage"